There is no need to curb your enthusiasm, because Larry David’s cringe comedy won’t be cancelled anytime too soon. HBO has renewed his Curb Your Enthusiasm TV show for a 10th season. There was a six year hiatus between the eighth and ninth seasons of the retro-scripted improv series, but that won’t be the case, this time. Production should kick off in the spring of 2018. A semi-autobiographical HBO comedy, Curb Your Enthusiasm stars co-creator Larry David as a fictionalized version of himself. The cast also includes Jeff Garlin as Jeff, Susie Essman as Susie, J.B. Smoove as Leon, and Cheryl Hines as Cheryl, along with Richard Lewis, Bob Einstein, Ted Danson, and Mary Steenburgen. 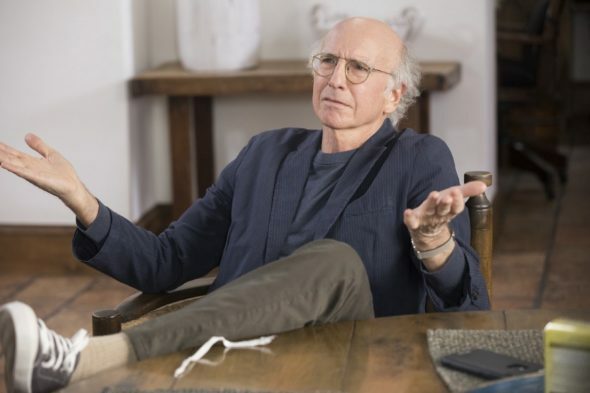 The ninth season of Curb Your Enthusiasm averaged a 0.35 rating in the 18-49 demographic and 1.02 million viewers. Compared to season eight, way back in 2011, that’s down by 62% and down by 49%, respectively, but the TV landscape has completely changed. Out of the 22 HBO TV shows we’re tracking, Curb ranks 10th in terms of its demo ratings and ninth when sorted by total viewership. Check out this HBO press release on the Curb Your Enthusiasm season 10 renewal. Following the show’s ninth-season finale, which debuted Sunday, Dec. 3, the Emmy®- and Golden Globe-winning comedy series CURB YOUR ENTHUSIASM, starring Larry David, will return to HBO for its tenth season, it was announced today by Casey Bloys, president, HBO programming. Production will begin next spring, with additional details to be announced as they are confirmed. “We are thrilled that Larry will be back with his uniquely acerbic wit and comedic sensibility,” said Bloys. Debuting on HBO in 2001 and presenting 90 episodes to date, CURB YOUR ENTHUSIASM stars “Seinfeld” co-creator David as an over-the-top version of himself in an unsparing but tongue-in-cheek depiction of his fictionalized life. Season nine credits: CURB YOUR ENTHUSIASM was created by Larry David; executive produced by Larry David, Jeff Garlin and Jeff Schaffer.